For 30 days, every time you make a purchase, take three seconds to notice what you spend your money on. Send me your stories about your discoveries. The point was not to change your behavior, or to beat yourself up with what I like to call “the budget stick.” The point was simply to notice. You sent me a lot of great emails, with some awesome stories about your experiment. Maybe you noticed you spend more money on groceries than you’re comfortable with (or less). Or maybe you discovered that all those little purchases you make on Amazon add up to quite a lot. Either way, for many of you, noticing was just the tip of the iceberg. And while I do feel that noticing is an end in and of itself, I wanted to try to address that question. To do so, I’m going to share the story that inspired me to write the article in the first place. It’s a story about a friend I’ll call Tim. A few months ago, Tim began making a conscious effort to notice his spending (using a method, in fact, similar to the 30 days and three seconds one). “Coconut water, $3.73,” he would note, “interesting.” That’s it. No judgment, just a quick note, and then he would move on. The next step Tim took was to enter each item into a spreadsheet. It’s super easy to do and takes less time than you might think (or you can look at your debit or credit card statement). This sort of investing behavior is something I like to call values-based budgeting. The whole point of the “30 Days and Three Seconds” experiment is to set yourself up to do this kind of work. Step one: notice. Become aware of your expenditures. Step two: track. Put your monthly purchases into a spreadsheet. Step four: reinvest. When you find places that your spending could be better invested in other values, make the change. Imagine if you did this for two years. That’s $7.50 and 30 minutes a month, times 24 months, which adds up to $180 and 12 hours. How would you like a free $180 and 12 hours a month to invest in things you really care about? The truth is, it’s yours for the taking. The key though — the secret, really — is awareness. If you don’t take the first step of noticing where your money is disappearing to in the first place, you’ll never find the money and time you could be investing elsewhere. 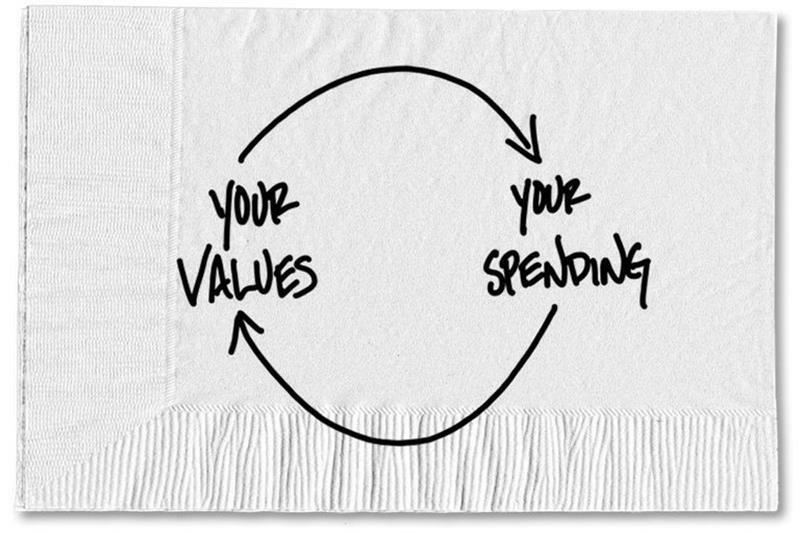 0 responses on "Featured Blog: An Essential Budget Query: Is This Spending Aligned With My Values?"